CAMAS — For Camas resident Dareena Stepanyuk, participating in politics goes far beyond voting in elections. The 2017 Camas High School graduate already is making her way in the world of local government, with a passion for serving the community and local constituents. Stepanyuk is the daughter of Russian immigrants and the youngest of nine siblings. She has lived in Camas her entire life. She graduated Camas High School last year, and currently attends Clark College, with plans to transfer to Washington State University Vancouver to major in Public Affairs with a minor in Political Science. “We were always very politically engaged in my family,” Stepanyuk said. But she noted that while they always voted and followed politics, her family never became heavily involved beyond that. 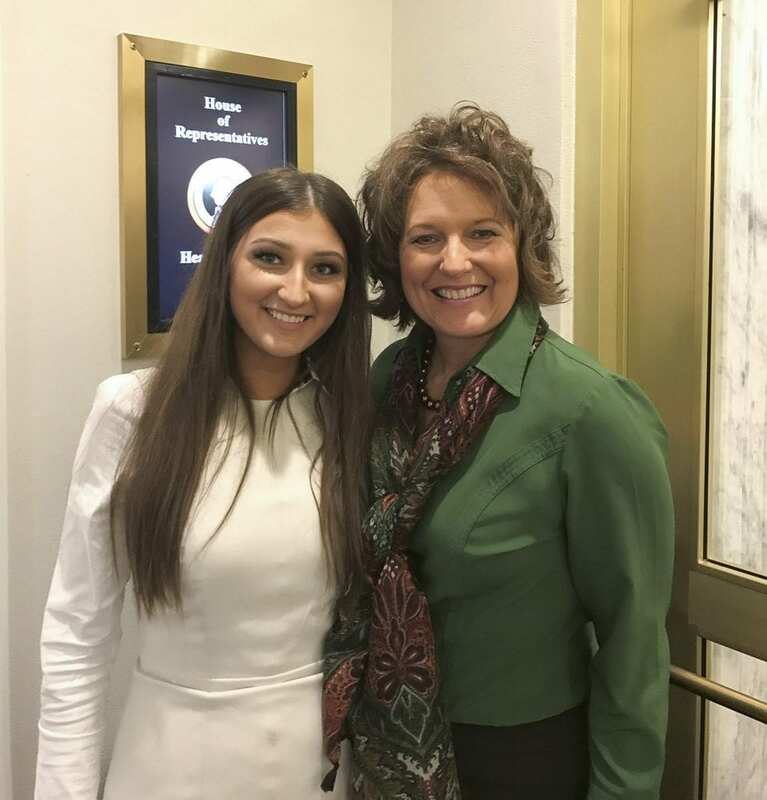 That all changed for Stepanyuk during her senior year of high school, when for a senior project she job shadowed Rep. Liz Pike. “She definitely got me into things,” Stepanyuk said. Stepanyuk said that the results of her time with Pike was somewhat unexpected, but that it had a profound impact on her life. She went to Olympia with Pike, and Stepanyuk said one of her most important memories of that time was when Pike placed her in front of the House Republican Caucus and told her to address them. Pike said the unusually bold teen has no problem sharing her thoughts in any forum. Stepanyuk’s engagement in local politics did not end when she completed her senior project. Indeed, she has become even more heavily engaged. Currently, Stepanyuk works as an intern for Congresswoman Jaime Herrera Beutler. She will go to Washington D.C. in July to work as an intern in the United States Capitol building. In December, Stepanyuk hopes to return to Washington D.C. to work as an intern at the White House. She also volunteers for the Clark County Republican Party. Stepanyuk’s public service goes beyond volunteering and internships. In January, she was appointed by the mayor and city council of Camas to serve on the city’s parks and recreation commission. According to Stepanyuk, she had initially applied last December to fill a vacancy on the Camas City Council. While she did not get the position, she said that members of the city council encouraged her to apply for one of several open positions on city commissions. “I chose parks and rec because I feel like I’d actually make a difference on it,” Stepanyuk said. Making a difference in the local community is a thread that connects all of Stepanyuk’s involvement in local government. She said that when she first went to Olympia with Pike, she saw the large number of constituents and lobbyists trying to have their issues and problems addressed by the government. After seeing some of the problems Washington residents are facing, Stepanyuk said that she got involved to help the people. A self-described person of action, Stepanyuk said that she became involved in local government because a lot of people say they want to make a difference, but then never actually take any action. For Stepanyuk, she did not let her young age act as an excuse to not become involved. In all of her work, Stepanyuk said that she is involved because of a desire to make citizens happy, and because she likes seeing work get done. “I just like doing stuff for the community,” Stepanyuk explained, and noted that she wants people to be happy. She said that she also believes unity is important, regardless of one’s political views, and that she wants to work to satisfy people and thereby help foster unity. By focusing on helping constituents and citizens at a local level, Stepanyuk believes that unity can be achieved. Her main focus is on local government, she said, as she believes that is where the most difference can be made. Stepanyuk said that her time working with Pike was among the most memorable and influential in her life. The feeling is mutual with her fellow Camas resident and mentor. In high school, Stepanyuk was also a part of the business education group DECA. Her time as a participant in DECA and working on business projects with the organization was a second highlight of her high school career, Stepanyuk said. With such a heavy involvement in local government so soon after graduating high school, it comes as no surprise that Stepanyuk has future plans after graduating college to become more involved in local government. She said that she plans to run for a city council position or possibly a position in the state legislature. Stepanyuk said that she is currently working to gain experience now to support a campaign in the future. Her plans involve staying in Washington and working in government in the state, where she believes she will be able to make the most difference. “I don’t believe in being a career politician,” Stepanyuk said about her future goals. She said that instead of making politics a career, she would rather stay in office long enough to make her constituents happy and address important issues. However she emphasized that she does not believe politics should be a long-term career.